Good morning everyone! Here's my simple take for the CAS57 challenge this week. The theme is "A Different Shape-abilities" wherein you'll use different shape die cut on top of another die cut shape (am I making sense? LOL!) I guess you get the picture upon seeing my card. :) This is an engagement card requested by a churchmate for her friend. 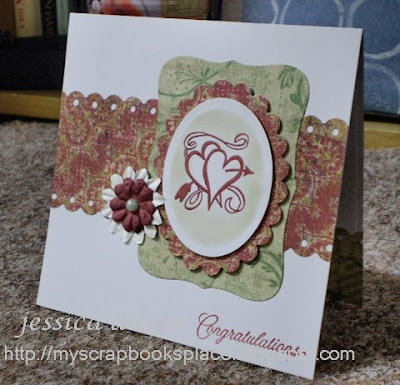 The image is from Kaisercraft, stamped with Versafine Crimson Red and heat-embossed with clear ep. I also did the same thing for the sentiment which is from Stampendous. (I used my Stamp a Majig on this one). It really comes handy especially when you want to stamp near the edge of the card directly. ;-) The lovey dp is from K&Company Classic K Charlotte. My pearl is also from K&Company which I bought from OZTION and arrived yesterday.